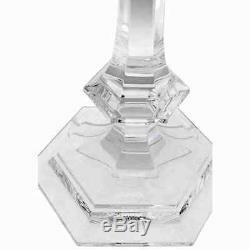 Baccarat Crystal Our Fire Candleholder from the Darkside Collection by Philipe Starck. 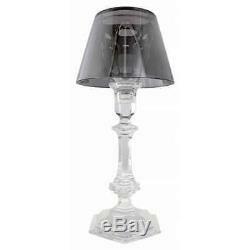 Harcourt inspired clear crystal base, silver crystal lampshade, Metallized crystal lampshade, clear full-lead crystal Versailles candleholder base. 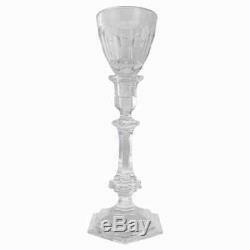 Baccarat Our Fire Candleholder with Silver Shade by Philippe Starck 2600415. We only sell brand new and authentic, first quality merchandise with original parts and packaging. We never sell refurbished goods, factory seconds or replica products. Why such a great discount? We're not an authorized dealer; this gives us the freedom to set our own prices and discount as much as possible. Our watches are fully warrantied and other merchandise is guaranteed against defects. Tracking numbers are sent out moments after an order ships. We cannot change an address after your order has been placed. We apologize, but we can't mark your order as a gift. 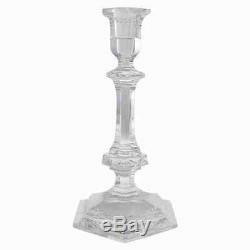 The item "Baccarat Our Fire Candleholder with Silver Shade by Philippe Starck 2600415" is in sale since Wednesday, October 24, 2018. This item is in the category "Pottery & Glass\Glass\Art Glass\French\Baccarat". The seller is "leperfect" and is located in Brooklyn, New York. This item can be shipped to United States, Canada, United Kingdom, Denmark, Romania, Slovakia, Bulgaria, Czech republic, Finland, Hungary, Latvia, Lithuania, Malta, Estonia, Australia, Greece, Portugal, Cyprus, Slovenia, Japan, China, Sweden, South Korea, Indonesia, Taiwan, South africa, Thailand, Belgium, France, Hong Kong, Ireland, Netherlands, Poland, Spain, Italy, Germany, Austria, Bahamas, Israel, Mexico, New Zealand, Singapore, Switzerland, Norway, Saudi arabia, Ukraine, United arab emirates, Qatar, Kuwait, Bahrain, Croatia, Malaysia, Brazil, Chile, Colombia, Costa rica, Panama, Trinidad and tobago, Guatemala, Honduras, Jamaica, Barbados, Bangladesh, Bermuda, Brunei darussalam, Bolivia, Ecuador, Egypt, French guiana, Guernsey, Gibraltar, Guadeloupe, Iceland, Jersey, Jordan, Cambodia, Cayman islands, Liechtenstein, Sri lanka, Luxembourg, Monaco, Macao, Martinique, Maldives, Nicaragua, Oman, Peru, Pakistan, Paraguay, Reunion, Viet nam, Uruguay.